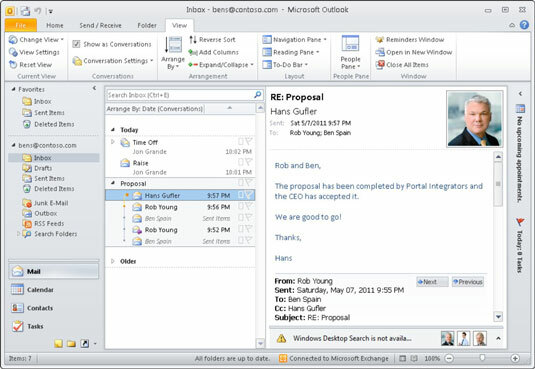 Microsoft Outlook 2010 from Office 365 has a feature geared toward helping you keep track of all those conversations. The feature automatically groups conversations by subject. Like it or not, e-mail has become a primary means of communication for the modern information worker. It is not uncommon for many people to send and receive a truckload of e-mails on a daily, if not hourly, basis. Keeping track of different e-mails on different topics with different people can be a daunting task. Notice that Proposal is the subject of the e-mails and the entire conversation is grouped for easy reading. You can even see your response e-mails and any meetings associated with this conversation. No more digging through your Sent box looking for how you responded to a particular e-mail. You can turn on the Conversations feature by clicking on the View tab in Outlook and then checking the ‘Show as Conversations’ check box. Exchange Online gives you access to your own personal e-mail archiving system. Your personal archive shows up as another mailbox right next to your regular mailbox. You access your archive just like you access your regular mailbox. On top of that, when you need to search for an old e-mail, you can choose to search your archive in addition to your regular mailbox.